Stuffed and rolled with scallions, asparagus and carrots, drizzled with sweet home made teriyaki sauce and served with grilled vegetable. Grilled salmon fillet marinated in kahlua liqueur and herbs served with grilled vegetables. Grilled tuna steak encrusted with sesame seeds over a bed of spinach drizzled with tamari sauce. Fillet of salmon grilled and than baked with sea salt served with fresh lemon and vegetables. Grilled fillet of chicken served with vegetables and choice of sauce. Lightly grilled black peppered tuna in a red wine reduction mushroom sauce. Grilled rib eye steak with black pepper and onion sauce. Baked jumbo shrimp drizzled with savory garlic butter sauce. Rice noodle with chicken shrimp and vegetable and egg with a hint of curry. Shrimp tempura inside, topped with spicy salmon, Jalapeno, pepper, chilly sauce. Shrimp tempura, mango inside, lopped with sweet chilly sauce. Eel tempura, avocado, oba, seaweed outside with eel sauce. Shrimp‎ tempura, crab, spicy mayo inside, lopped with avocado and salmon mayo sauce. Pepper with tuna, avocado, kawari inside, topped with salmon, eel, avocado, crunch, spicy mayo and wasabi sauces. Baked Salmon, crunch inside, topped with tuna, avocado, red pepper and spicy mayo. 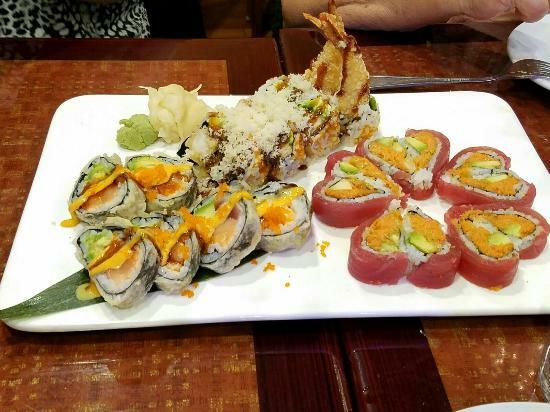 Shrimp tempura, lobster meal, salad cucumber, crab stick wrapped with soybean paper, topped with eel, avocado and eel sauce. Pepper tuna, avocado inside, topped with spicy tuna red hot pepper. Asparagus,‎ cucumber, kawari, salmon inside topped with salmon and salmon roe. Tuna, salmon, avocado, masago inside, deeply fried, topped with spicy mayo and wasabi sauces. Avocado roll, cucumber roll, oshinko roll. Tuna roll, salmon roll, yellowtail roll. Spicy tuna, spicy salmon, spicy california roll. 8 Pieces of tuna and 1 tuna roll. 8 Pieces of salmon and 1 salmon roll. 3 Pieces of tuna, salmon and yellow. 7 Pieces of sushi and 1 spicy roll. 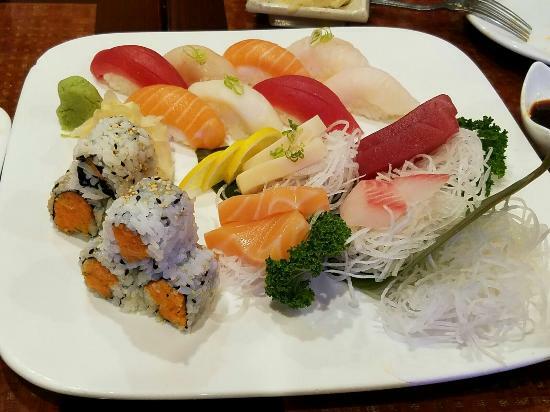 There are a ton of sushi places in the area, but Katana is our go-to place. The staff is always awesome and refilling drinks all the time. The prices are fair. They offer a spicy scallop roll that is uncommon in the local area. Our new go-to for sushi! Have tried many sushi places around the area before discovering Katana. It instantly became THE place to go when craving sushi. Creative sushi chefs with style and quality, fresh sushi. Highly recommended. Best of Sushi by a long shot with miles. Reasonable and good prices and always fresh. We’ve had selections from all over their very extensive menu and it never fails to deliver. Highly recommended. I wanted to try out a new sushi place by work so I found this place. The sushi is bland. The most is bland. Surprise right by my hotel! One of the best around!! Get quick answers from Katana Sushi staff and past visitors.